TheRustedChain - The Blog: 7 ways to Spice up your salad. 7 ways to Spice up your salad. The weather is warming up and I'm in salad mode again lately. I actually love salad, but really dislike boring or bland salads. I try to keep a big bowl of chopped greens in the fridge and have a small salad before meals, or sometimes a big salad as my meal. Naturally they can get boring. But I'm cautious about adding too much junk that makes them full of calories. Here are a few things to put on top to change things up and add big flavor. 1) rotisserie chicken. Buy one and pick off chunks to make your salad an entree. It'll last for several days. 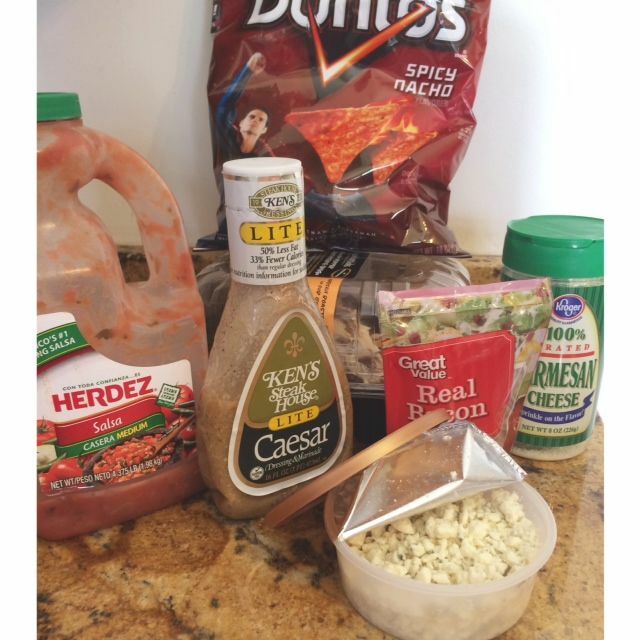 4) Ken's lite Caesar. This salad dressing has super intense bold flavor so a little goes a long way. I love it. 5) bacon bits. Homemade would be better, but I usually keep just a bag of store bought ones in the fridge. Again, a little goes a long way to change up the flavor of your salad. 6) Parmesan cheese. Fresh grated would be best, but sometimes the canned stuff will do too. It adds a salty-ness and perks up a salad. 7) blue cheese. I'm kind of obsessed with blue cheese. It's funky, bold, and delicious. A few other options would be hot sauce, lemon juice, salt & pepper.